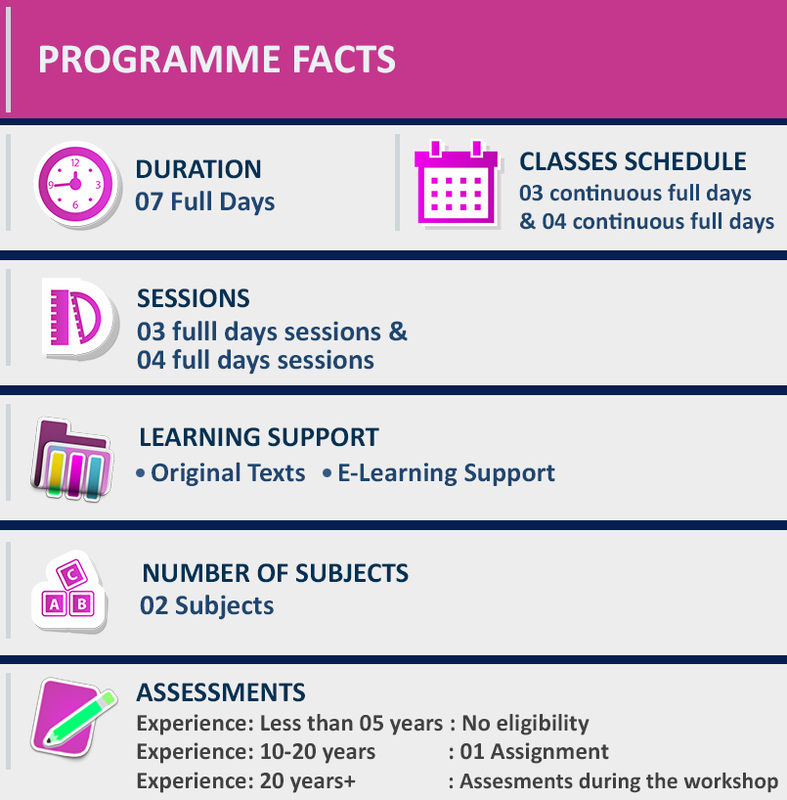 ICMA education programme comprises of sixteen subjects structured in to four stages and additional two subjects structured in the form of a workshop. Final stage comprising of the last four subjects, forms the Graduate Conversion Programme. Click below to view complete education programme of ICMA Australia. If you have a Degree from a government university/recognised foreign university or an acceptable professional qualification, you will have access to ICMA Graduate Conversion Programme. 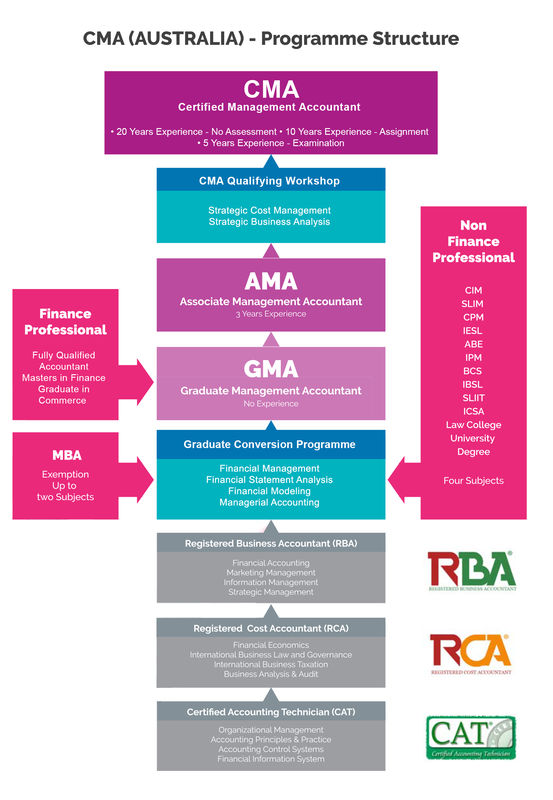 If you have an acceptable part completed accountancy qualification you may get access to ICMA Graduate Conversion Programme. On completion of this subject, the students should be able to appreciate the role of computers in modeling and analysing the financial activities of a business and in decision support; appreciate the problems involved in the implementation of computerised financial models and spreadsheets; recognise the ways in which computer-based financial models may be used by management and evaluate commercially available financial modeling software. Analyse and critically evaluate information for cost ascertainment, planning, control and decision making. Model and interpret financial accounting, cost accounting and other financial statements. On completion of this subject, the students should be able to understand the decision making requirements and the information needs of management; apply management accounting principles and techniques to a wide range of situations in both service and manufacturing industries; appreciate recent developments in the theory and practice of management accounting, control systems; and appreciate the developments information technology in relation to the provision of management accounting information. Select and utilise control systems which provide management control of the organisation. Provide management with appropriate information for control, assessing and reporting on performance, monitoring efficiency, effectiveness and value for money. This subject seeks to describe and explain the properties of financial statement numbers, the key aspects of decisions that use financial statement information, and the features of the environment in which these decisions are made. Understand the demand and supply forces of corporate financial disclosure. Apply analytical techniques such as common-sized statements and ratio analysis. Consider accounting method choice on accounting numbers. Undertake correlation and cross-sectional analysis of Financial Statements. Consider the impact of times series properties of financial statement numbers. On completion of this subject students should be able to apply capital budgeting principles and techniques to investment proposals in order to facilitate optimum decision-making, understand the risk/return trade-off inherent in portfolio analysis and selection; understand how to apply techniques suitable for valuing various debt and equity securities; examine and evaluate empirical research relating to the optimum financial structure of the firm; understand the nature, purpose and limitations of financial ratios and other data to evaluate performance and credit risks; examine and understand empirical research relating to the concept of market efficiency; examine and evaluate empirical research relating to the optimum dividend policy of the firm. Find, use, and manage funds in different organisations. Select and evaluate techniques used in treasury management and investment decision making. Analyse the changing, competitive business environment in order to formulate financial strategy. If you have a Masters in Business Administration Degree or an equivalent qualification from a government university/recognised foreign university, you will have access to ICMA Graduate Conversion Programme. ICMA qualifying workshop comprises of two subjects delivered in the form of a seven day programme and is compulsory for those who are seeking Certified Management Accountant (Australia) Membership. If you have completed the ICMA Graduate Conversion Programme, professional qualification in finance and accounting or a Masters Degree/Degree in fiancé and accounting, you can directly join the ICMA Qualifying workshop. On completion of this subject students should have developed skills of analysis, evaluation and synthesis in cost and management accounting and, in the process, create an awareness of current developments and issue in the area. The subject covers the complex modern industrial organisations within which the various facets of decision-making and controlling operations take place; the subject includes discussion of costing systems and activity based costing, activity management, and implementation issues in modern costing systems. Identify the basic conventions and doctrines of managerial and cost accounting and other generally accepted principles which may be applied in the contemporary cost management models. Identify major contemporary issues that have emerged in managerial accounting. Discuss a number of issues relating to the design and implementation of cost management models in modern firms. Identify the basic conventions and doctrines of managerial and cost accounting and other generally accepted principles which may be strategically applied across the various functions of a business organisation. Identify major contemporary issues that have emerged in strategic management accounting. Discuss a number of cost and management accounting issues relating to the design and implementation of strategic, marketing, strategic value and other management models in modern firms. To appreciate the management accountant’s role in the implementation of cost management systems for marketing decision making.